I had always lived in small towns. Really small towns. Big cities felt foreign to me. Most recently, I had lived in Goderich, a small town in Huron County. After university, I was offered a position in Toronto, and I was scared. I wanted to accept the job, but I knew exactly 1 person living in Toronto, and she was moving to Belgium about a week after I would be moving to the city. Then my roommate at the time said to me, “Toronto isn’t really that big, you know. You find your little community, and everything you need is there.” I’ve been here nearly 10 years now, and I can totally see what he meant. I wouldn’t consider myself a full-fledged city slicker. I still like to nurture the small-town girl inside of me. It’s funny, you spend most of high school finding every excuse to leave your small town, and then only see its virtues once you’ve moved away for good. Now, sometimes, I yearn for Huron County in a way I never thought I would. Here in Toronto, whether I’m spending time with my three-year-old son, having date night with my husband, or even just getting some “me time,” these are the things I like to do to replenish my rural roots. 1. 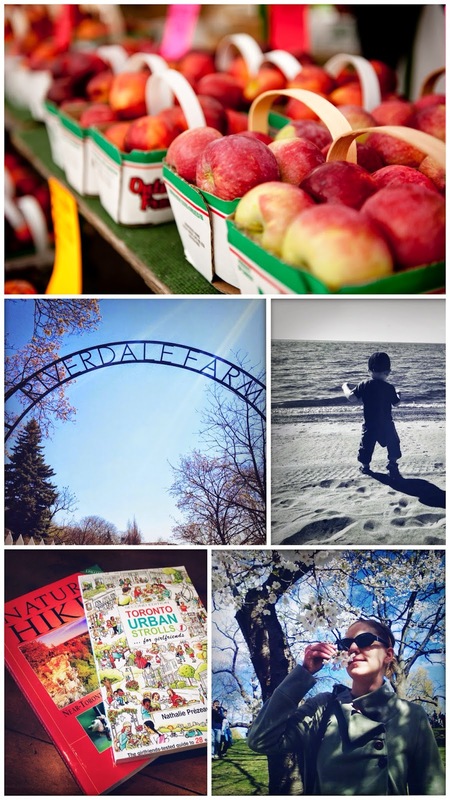 Riverdale Farm – This is one of my favourite places to go with our two-year-old, and not just because it’s free! He loves to see the animals and run along the paths and in the barns. It’s such a wonderful escape in the city with the kids. A 30-minute drive from the city centre, you can also find Whittamore’s Farm. We also love it there, especially in the fall as they are famous for their Pumpkinland around that time. 2. Toronto Island – After taking the ferry ride over from the city, it’s amazing to see just how close this calm space is to the city. One popular family activity is to rent bikes and bike around the islands. I recently was with a group of people who rented canoes from the Harbourfront. We canoed over to and around the islands. Stopped for lunch, and canoed back to the city. 3. Visit the beach – You don’t have to leave the city to hit the beach. Toronto has a few great ones. I’ve taken our son early in the morning during the week. It’s not too busy, and he loves playing in the sand. I was totally in awe of just how close a warm, pretty beach was to my home. 4. Irish pubs – I don’t know what it is about sitting on a patio with a pint of beer that makes me think of small towns. We like the Black Bull, but that patio is pretty urban-central, so for something quieter, I’d recommend Bedford Academy. 5. City walks – The neat thing about Toronto is that while you’re exploring the city, you end up in these little pockets that, even just for a moment, transport you to somewhere else. You can wander on your own, but I’m a lists and guides type of person, so I like the books Nature Hikes (Near-Toronto Trails and Adventures) and, my new favourite, Toronto Urban Strolls for Girlfriends. 6. Farmers’ Markets – Granted, I usually do this one with our little one in tow, but he isn’t particularly interested in the fruits and vegetables I’m picking up. You can find farmers’ markets all over the city, so it doesn’t matter which neighbourhood you live in. We like the East Lynn Park Farmers’ Market. There’s also a playground and splash pad at the park and they often have children’s activities during the market on Thursday afternoons. 7. Spending time with my girlfriends – I think one the biggest things that keeps me from feeling swallowed by such a large city is having close friends I see regularly. Unlike the small towns I lived in where, for better or worse, everyone knew each other, I don’t have to know and be friends with all 6 million people in the GTA as I once thought. Instead, these women give me a sense of community and support that sticks… even when the subway is down, it’s pouring rain, and I can’t find a cab to work. This post was originally published on The Ruralist in July 2014.